The first graders of the elementary school were equipped with safety vests this week. The 50 safety vests were handed over by Mayor Tim and Dieter of the ADAC. “Just makes sure” is the name of the security campaign of the ADAC Foundation for first graders, supported by the cooperation partners Deutsche Post DHL and Radio Herford in the poster campaign. “School in sight. Kids in view. “Is the motto of this year’s safety campaign for first graders. But not only on the way to school should tighten the visually striking safety vest become a matter of course. It should always be part of their free time as well. Experts assure that the children are already visible from afar by the signal effect of the neon yellow safety vest of the ADAC Foundation. The vest with the reflective material contributes significantly to the safety of children. 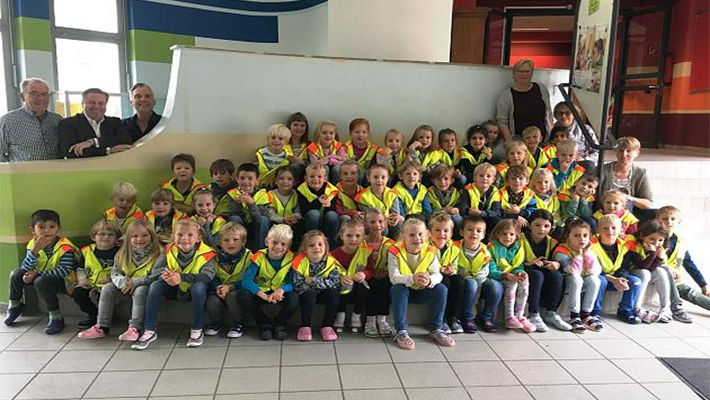 As part of the ADAC Foundation First Campaign security campaign, a total of 215 safety vests with reflective fabrics were distributed to the new schoolchildren – thanks to the support of the ADAC local club – of 760,000 nationwide. The entire logistics – shipping, customs clearance, packaging and shipping – from 30,000 parcels to 16,000 elementary schools will be provided free of charge by Deutsche Post DHL as a contribution to cooperation. Radio Herford has handed over three posters to the elementary school in the safe way to school. The posters will be visibly attached to the school’s staging roads soon.